Reconnaissance work on Starting Pitchers for the upcoming season brought me to Blake Beavan of the Seattle Mariners. Beavan is not, yet, expected to win a spot in big league rotation, but he’s 6’7” 240 lbs. and he started 15 games for the Mariners, as a 22-year old, last season. So, there is reason for optimism. In fact, the Mariners are displaying some confidence by starting Beavan in their cactus league opener on Friday. 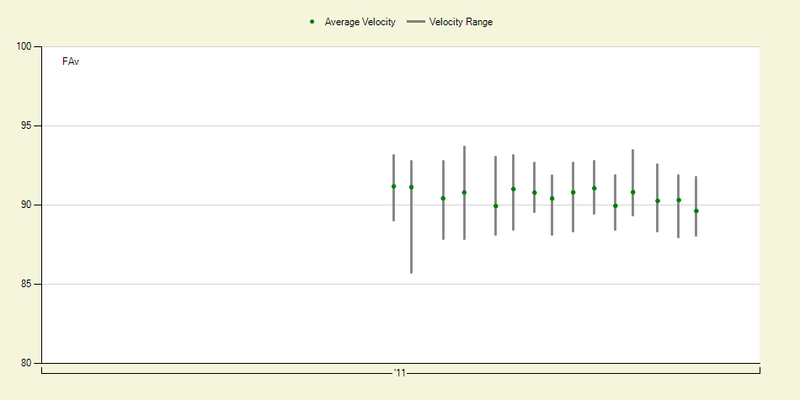 Below is Blake Beavan's velocity chart from Fangraphs. If you can see the image on your screen, you’ll see the range of velocity for Blake Beavan’s fastball in each Major League start last season. His fastball only scraped 94 mph once or twice. Quite a few pitchers have been successful throwing in the low 90’s, especially if they have Blake Beavan’s control. Last year, Blake Beavan only walked 15 guys, in 94 innings, over 15 starts. His flaws lead to 106 hits, 13 of which were home runs, while striking out only 42. Beavan has the walks under control, but he needs to give up fewer home runs and strike out more batters. As they should say, two out of three ain’t bad, but one out three is. Yeah, well, okay big deal, and so what? The Mariners’ offense still stinks. So, even if Blake Beavan had 30 starts in the big leagues, he’d probably only win 10-12 games, if that. Beavan was a big part of the Cliff Lee deal. Could those OpBA number be right? Are we to believe that Blake Beavan allowed a .125 Batting Average on fastballs and a .500 batting average on Sliders and still threw sliders 12% of the time? The pitch frequency data from Texas Leaguers and Fangraphs show slight differences from ESPN, but everyone has Blake Beavan throwing plenty of breaking balls. 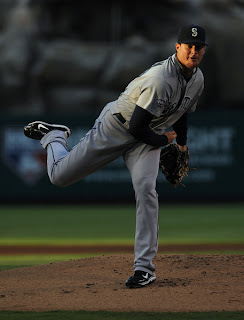 Blake Beavan was called up in July. Looking at his Texas Leaguers Pitch F/X stats by month, he did not show an adjustment to less breaking pitches. At least he threw fewer sliders, according to Texas Leaguers. 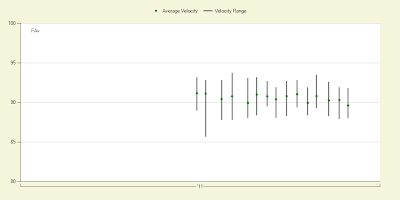 To watch for classification bias of a human or machine determining what is a curve or slider, we can combine both to see a pattern of breaking pitches (where batters have hit over .400) to Fastballs and Change Ups (with opponents' batting average down to .125). If ESPN's Opponents' Batting Average numbers are correct, Blake Beavan's pitch selection is on an unhealthy trend. Where’s the story behind the story? ESPN’s revered Mark Simon is the person to ask about this. With youth on his side, Blake Beavan has time to improve his breaking stuff and be a very good starter. However, if his feel for breaking pitches doesn't develop, he has shown signs to be dominant out of the bullpen. *We talk about Fangraphs and Baseball-Reference all the time around here, and we should. Both of those sites are tremendous. At the same time, we need to give Big Ups to Texas Leaguers. The Pitch F/X database at Texas Leaguers is so incredibly detailed. They count individual pitch types, spin rates, vertical and horizontal movement, location, hit spray charts, and much much more. They have individual matchups between batter and pitcher. With pride believing I'm the only person to ever share this specific link, here is how Blake Beavan fared against Bobby Abreu in 10 plate appearances. Thanks for reading. If you see Mark Simon around town, please ask him about Blake Beavan.